Ellen, National Geographic, The Huffington Post -- adorable PeeWee, the Northern Fur Seal, has done them all. What's so special about PeeWee? In a word, freedom. The rehydrated seal was released back into the ocean locally off the west coast of Vancouver Island (near Tofino) after 2 1/2 months of rehabilitation at The Island Wildlife Natural Care Centre on Saltspring Island, British Columbia. A video of PeeWee's exhilarating taste of new found freedom has gone viral. At first PeeWee is apprehensive and unsure of returning to the wild, but when he realizes what's happening and gets a taste of the ocean, his excitement is captivating. 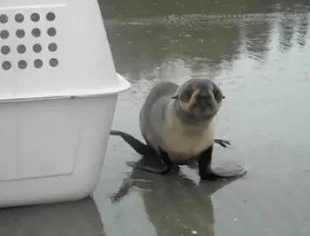 Click below to watch little PeeWee's release. We guarantee your heart will melt. The waters off Vancouver Island are home to many Northern Fur Seals, according to the authors of the video at the Wildlife Natural Care Centre. Juvenile Fur Seals spend two years out at sea, hunting, evading predators, and swimming between Alaska and California. For more information about helping beleaguered seals like PeeWee plus more adorable videos and pics, visit sealrescue.org. Looking to live life a little greener and healthier? Lavish & Lime is a great place to start. We have hundreds of unusual gifts and everyday eco finds all good for you and the planet too. If you have any thoughts or ideas about PeeWee or wildlife rehabilitation in general, please leave a comment below - we'd love to hear from you!